Who are you calling a cricket? I feel like a brand new bug. *Where 1 million = 9. Here’s another Taxonomy Fail for your edification and/or entertainment. I’m not sure who first mislabeled (or at least, mis-described) this image, but it pulls up on a number of blogs and sites with the erroneous story attached. …she’s eating a grasshopper. They *are* bother orthopteroids, but I don’t think it counts. 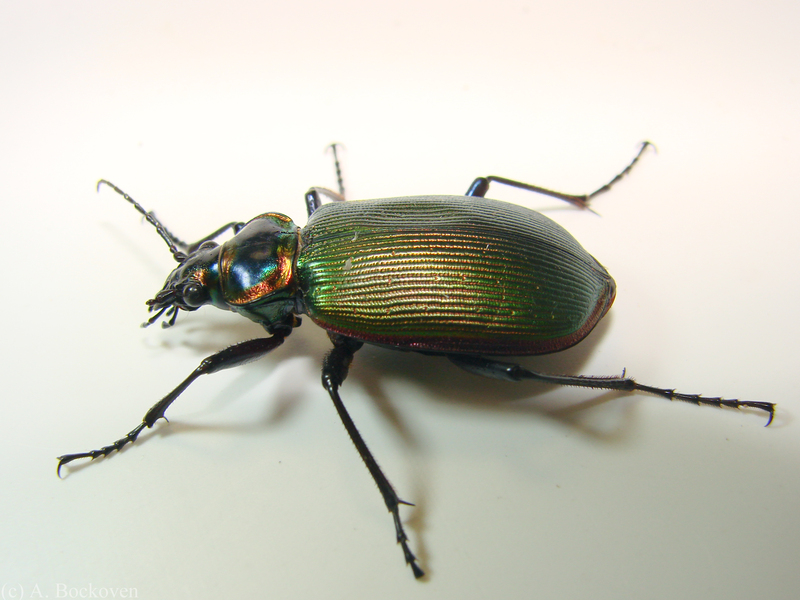 Calosoma scrutator, the fiery searcher. Here’s a colorful beetle I run across fairly often (they are extremely popular in student collections). 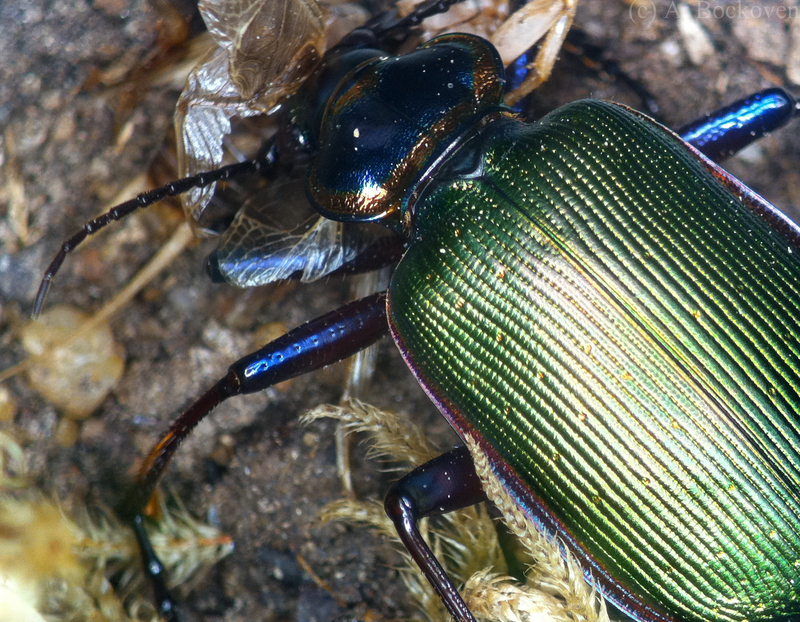 While many members of the genus Calosoma, the caterpillar hunters, are black in color, a handful of species (in the creatively named subgenus Calosoma) have metallic green elytra. Calosoma scrutator, the fiery searchers, are further distinguished by a red/gold band around the edge of the wing cases. These beetles are fast and aggressive, preying primarily on caterpillars as both adults and larvae. We recently had a few live beetles donated for an insect zoo we did for a local elementary school, and I got to spend a good deal more time observing them than I ever have in the field. Caterpillar hunter attacking a cricket. Not having any caterpillars around, I’ve been feeding them crickets, which they do well on so long as everybody in the tank gets their own cricket meal. 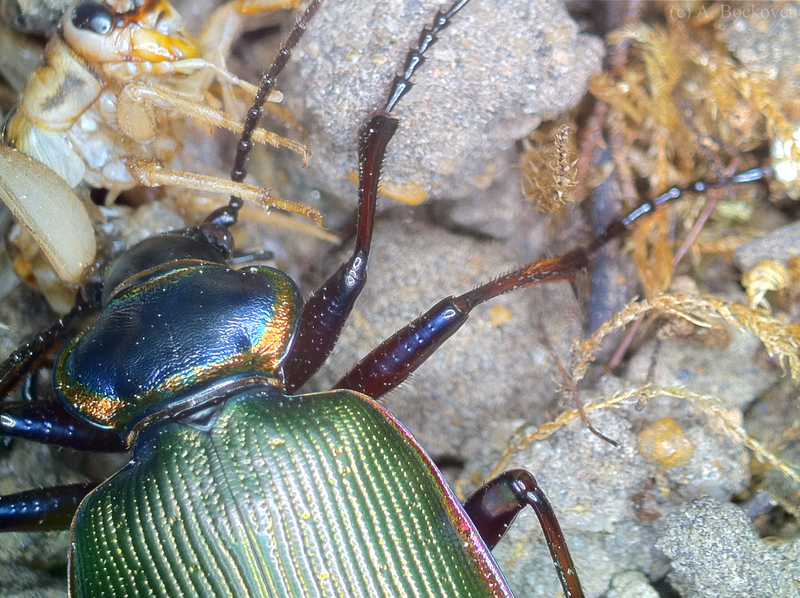 There’s a good deal of scrambling and tussling as each beetle attempts to secure a cricket and retreat to a quiet spot to eat, easily devolving into slapstick if two possessive beetles happen to bump into each other. I’ve started passing out crickets with tweezers to minimize the chaos. Luckily, they all appear to be too armored to take any real damage from each other, and they haven’t shown any inclination to eat each other–though at least one forum thread I found says they may. When not eating or searching about the tank they spend most of their time burrowing or tucked under bits of wood and debris. Caterpillar hunters possess a ferocious pair of mandibles, but don’t appear to be particularly adept at manipulating their struggling prey–unlike spiders with their pedipalps or mantises with their raptorial forelegs. 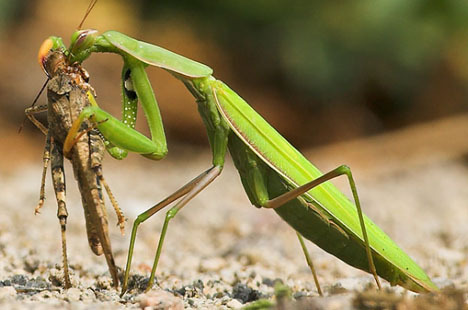 Instead they scissor away at the soft fleshy parts of their prey, slowly masticating it into a pulp. I have some rather alarmingly gory video that I’ll try to get up at some point. Apparently the adults have been known to live for an impressive three years, so I’ll have to see if I can keep these flashy fellows around. 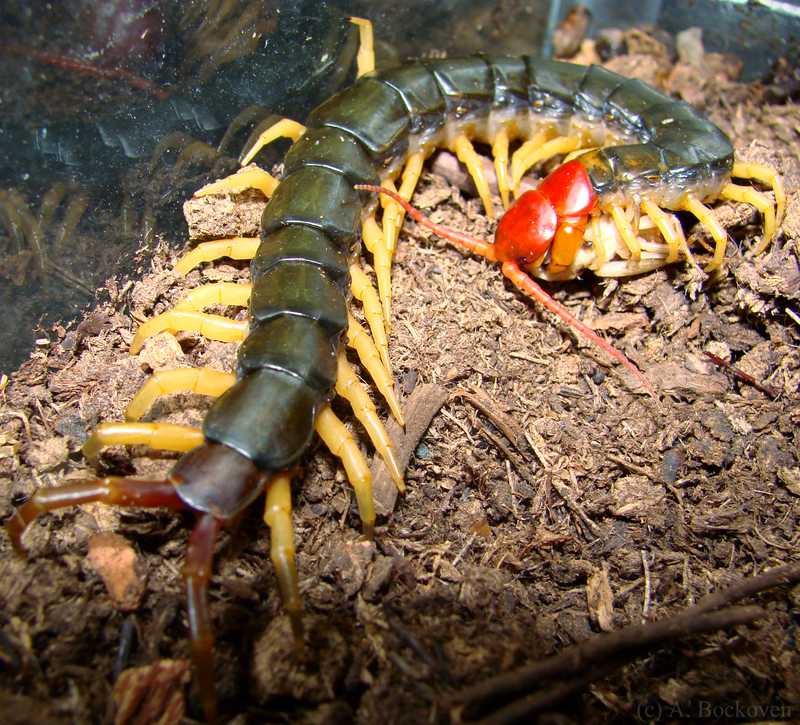 Here’s a dramatic local: the red-headed centipede, sometimes called the giant centipede. These guys are the largest bodied centipede in North America, so they’re good for pretty good startle when you suddenly encounter one beneath a log. Centipedes belong to the class Chilopoda, meaning “lip foot.” They get this name from the first pair of legs, which are modified into jaw-like “venom claws,” or maxillipeds. You can see the thick venom claws curving forward from the first red segment directly behind the head. 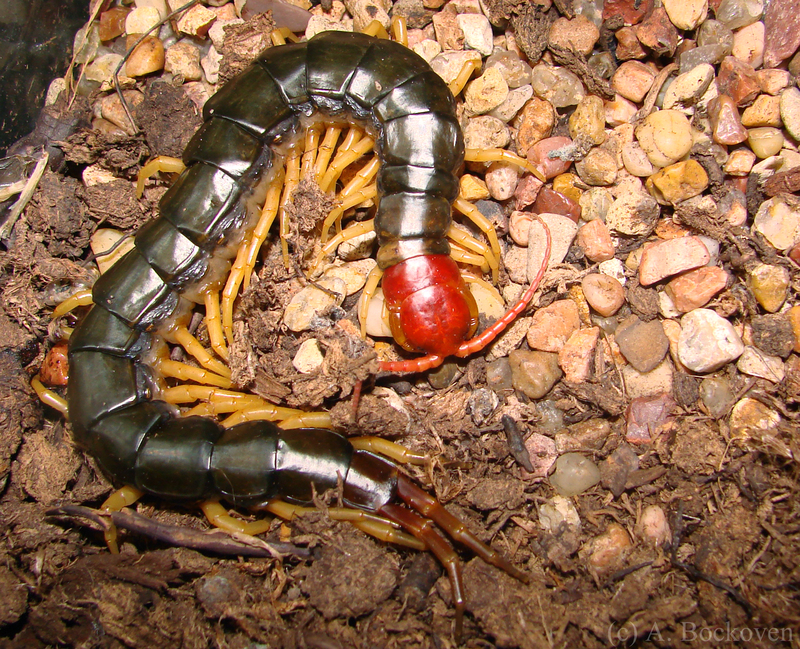 A red-headed centipede devours a cricket. Centipedes, unlike herbivorous millipedes, are active predators designed for rapid movement through leaf litter and under logs. They have only one pair of legs per segment (as opposed to the millipedes’ two) and tend to have dorsoventrally flattened bodies. I don’t appear to have the small skittery creature freak out gene, but I always forget how creepy I find these guys. Their particular brand of fast sinuous movement hits me on an instinctive level. It’s definitely fun to watch them eat. In this species the long hind pair of legs is modified for grasping. I also noticed that the centipede seemed to use it as a kind of defensive false head, rearing up the hind quarters when disturbed and raising the legs like antennae. With the red tone of the final segment it’s a fairly convincing mimic. 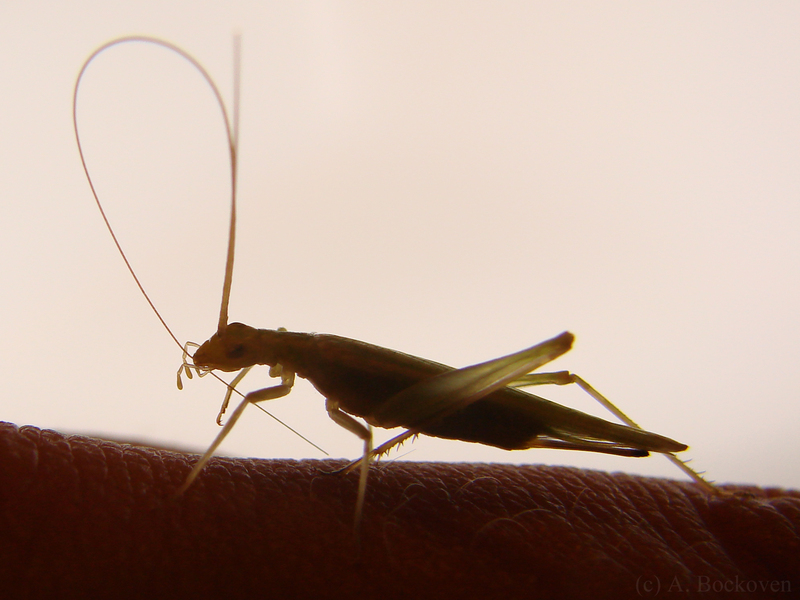 A female tree cricket (Gryllidae:Oecanthinae) grooms her antennae. Tree crickets are a fun, bizarre looking species of cricket in the subfamily Oecanthinae. 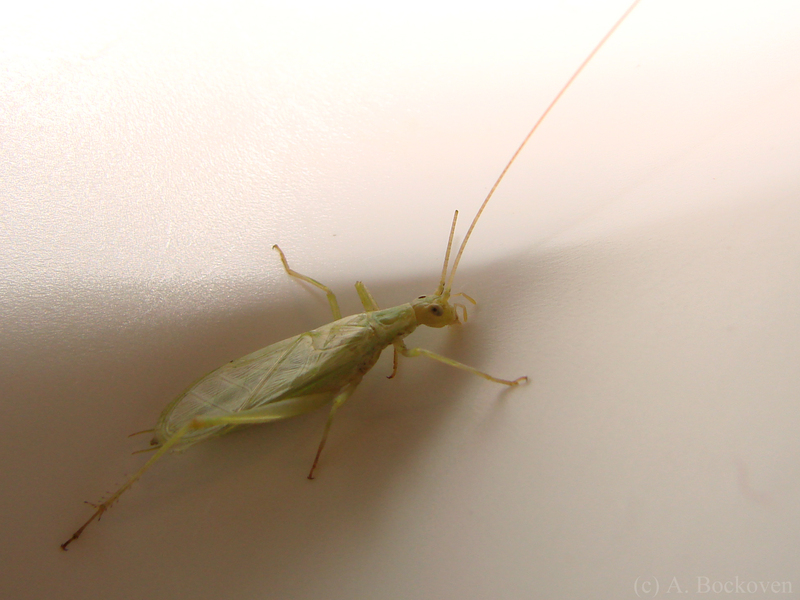 With their green color, delicate bodies, and strange flat wings on the males they don’t easily fall into the average person’s image of a cricket. As their name suggests, these crickets live in trees and shrubs, where they take in an ominivorous diet of plant matter and small insects. Because of this somewhat cryptic life history they are seen less commonly than they occur. The best way to find tree crickets is beating trees and shrubs especially at night. They may also be tracked by their calls, or come to lights. The male and female pictured here turned up while sweeping brush at the Texas AgriLife field station. Male tree crickets (Gryllidae: Oecanthinae) lack ovipositors and have flatter, broader wings specialized for courtship song. 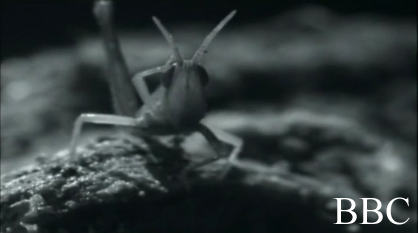 The most interesting fact I learned about tree crickets: When the male sings, his wing rise up, exposing a special dorsal gland that secrete a tasty snack for the female. While she’s on top chowing down on this nuptial gift, the male takes the opportunity to mate, singing all the while. The spermatophore that is passed from male to female remains partially extruded, so the snacking and singing serves an additional purpose. The male must keep the female distracted so that she does not consume the spermatophore before the sperm has been transferred. Katydid nymph on a leaf (Tettigoniidae). I found this impressively large katydid nymph hanging out at a gas station. I thought he provided a particularly clear illustration on the difference between adult and juvenile wings in grasshoppers, katydids, etc. Adult and juvenile orthopterans can generally be distinguished by the presence or absence of wings. However, like other hemimetabolous insects, juvenile grasshoppers and co. gradually develop their wings as they move through larval molts, so later instars have signs of small, developing wings (wing pads or wing buds). 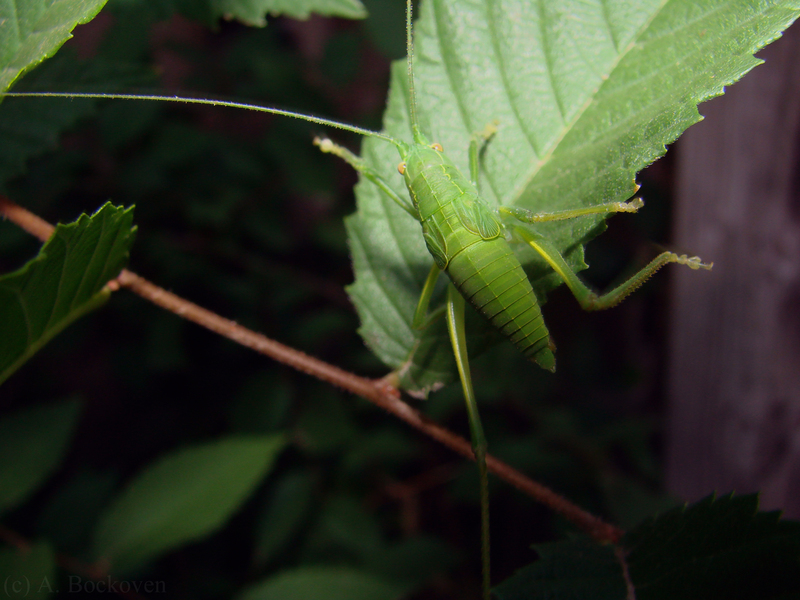 Moreover, some orthopteran species are brachypterous (short-winged) or apterous (wingless) as adults, further complicating the matter. In collections, which generallly exclude immature insects, such species are notoriously underrepresented. 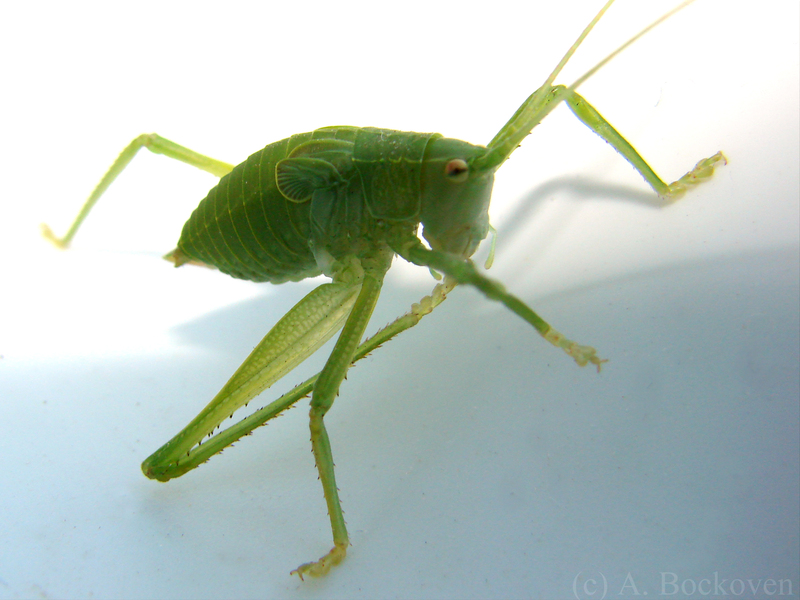 So the question is, how does one distinguish final instar grasshopper and katydid nymphs (those in the last juvenile stage prior to adulthood) from short-winged adults? Here’s the trick as I learned it from my labmate Paul Lenhart. Final instar katydid nymph grooming its hind leg. It took me a while to develop an eye for this, but the principle is fairly straight forward. In the last nymphal instar before adulthood, orthopteran wings “flip.” The hind wing (eventually to become the large, fan-folded flight structure) sits on top of the forewing (the elongate leathery tegmina which will protect the hindwing in adulthood). You can see this in the picture above. The main, costal vein of the hindwing is located dorsally (at the top), with a fan of veins running downwards, giving the characteristic “D” wing shape of a nymph. 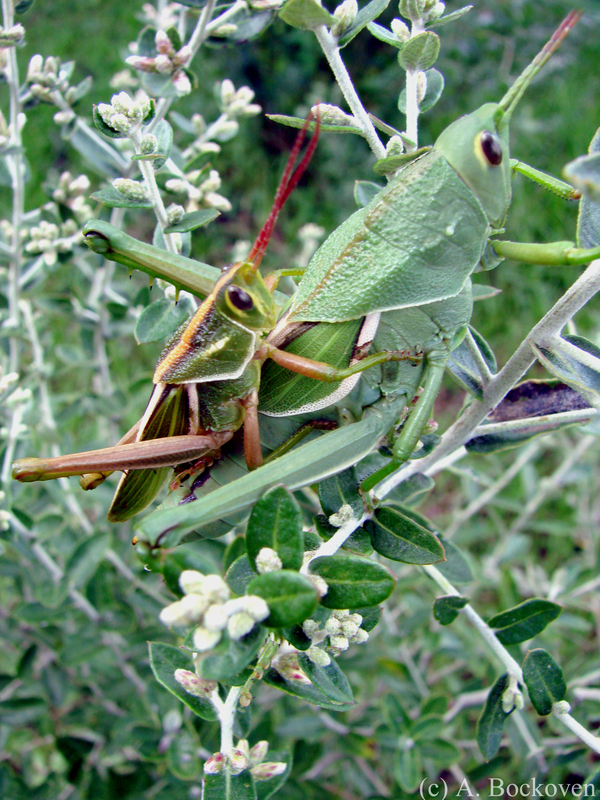 Sexually dimorphic male and female grasshoppers mate. After the molt to adulthood the wings flip again, tucking the hindwing under the forewing with the costal vein now located ventrally (to the bottom). Compare wings of the katydid nymph above to the more elongate, “U” shape of the forewing seen in these adult male and female lubber grasshoppers. The veins in the short forewing of the brachypterous female run mostly parellel, rather than fanning downwards. 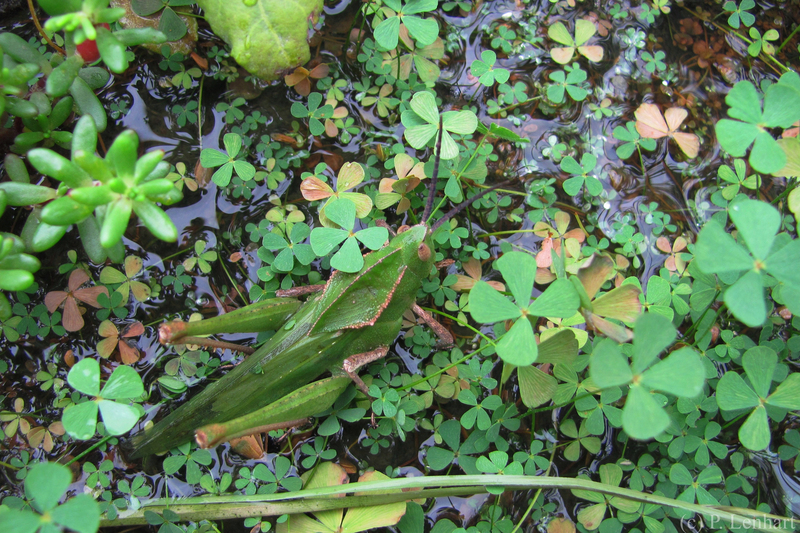 Among the Clover – Aquatic Grasshoppers? A crested grasshopper (Xyleus sp.) in a flooded clover field along the Paraná river. The grasshopper above is a member of the lubber family Romaleidae, genus Xyleus, a crested grasshopper. We encountered a number of these large fellows doing field work in Argentina last year. While we were there, frequent rains caused flooding in most of our field sites along the Paraná river. This made working with fire ants difficult. In one notable instance we returned to a line of sugar baits the following day and found tadpoles swimming around them. Not optimal for a fire ant foraging study. 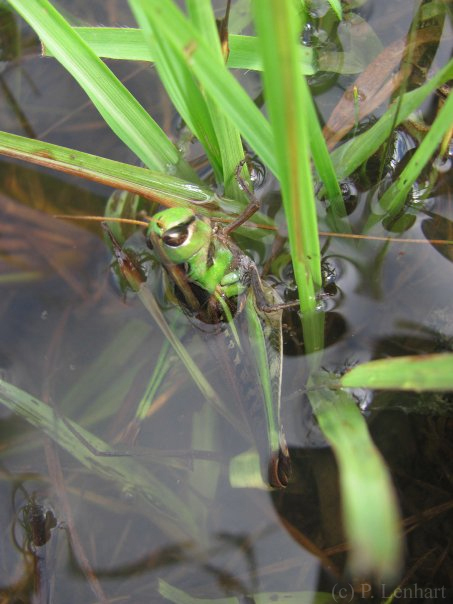 We also got to observe lots of insects coping with (and flourishing in) the flooded conditions, as in the case of the grasshopper pictured feeding half underwater below. Thanks to Paul Lenhart for photos, IDs, and being awesome! Rhammatocerus sp. grasshopper feeding in a flooded field along the Paraná. 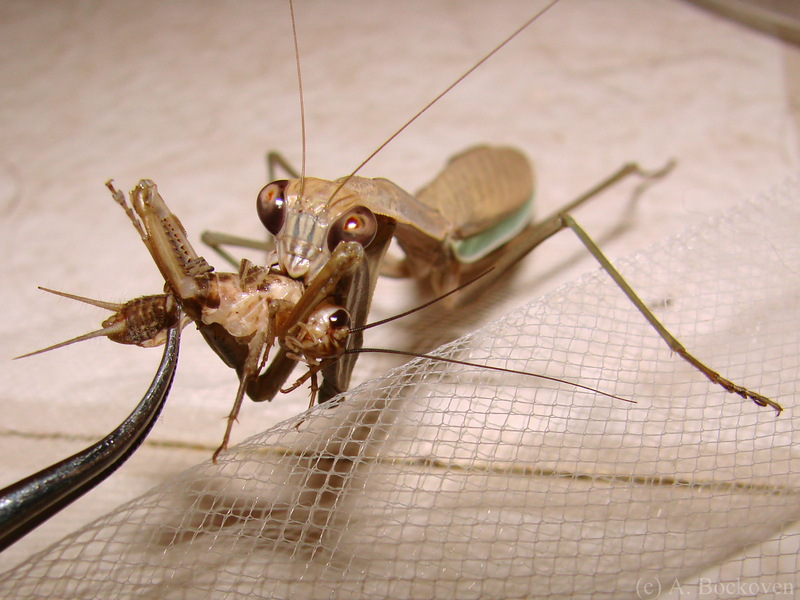 Adult Chinese mantis devouring a cricket (Tenodera sinensis). 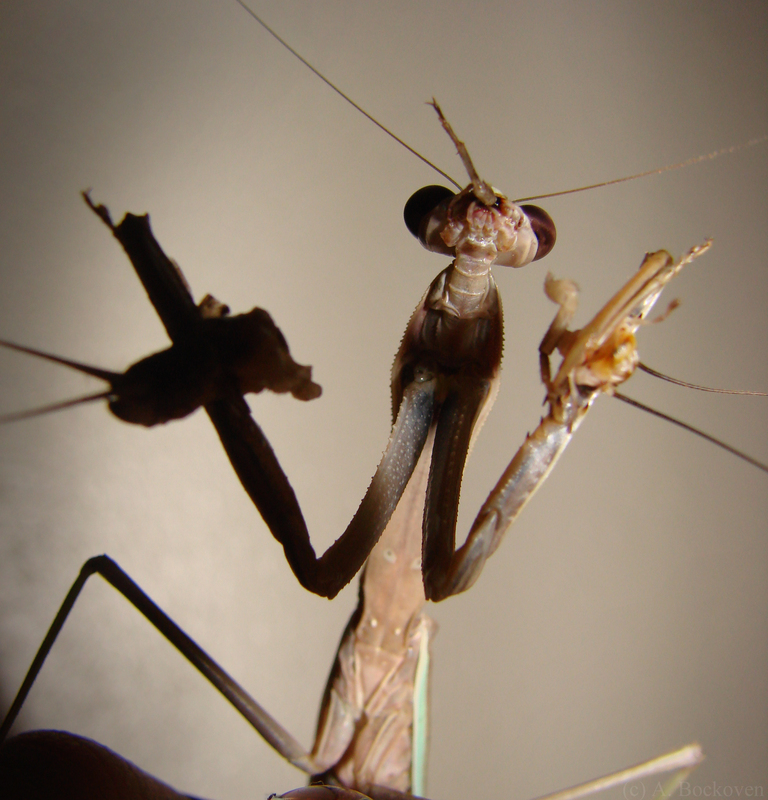 I promised pictures of the adult Chinese mantises from last week, so here you go. 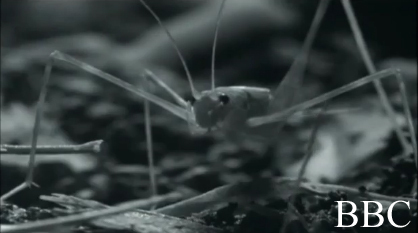 And to start off we have some lovely horror-movie-esque imagery of a mantis tearing into its cricket meal. Enjoy! 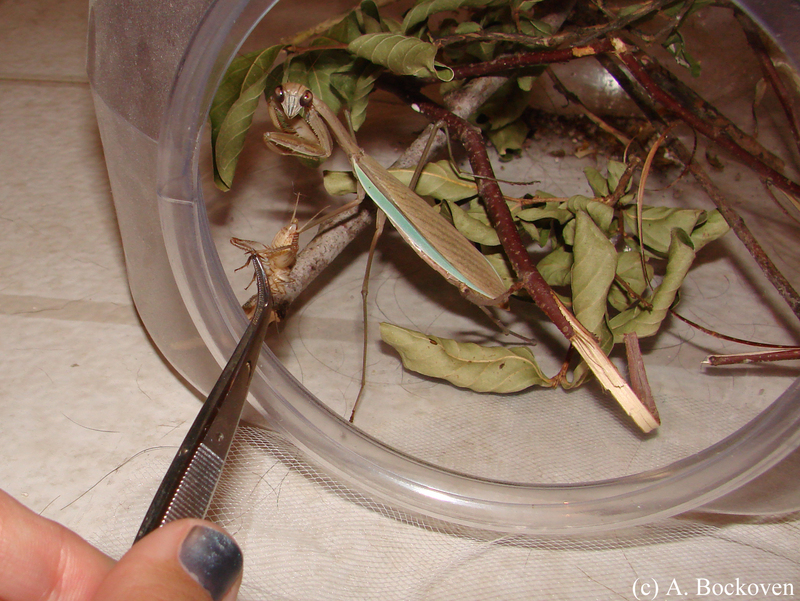 Hand feeding a Chinese mantis (Tenodera sinensis). 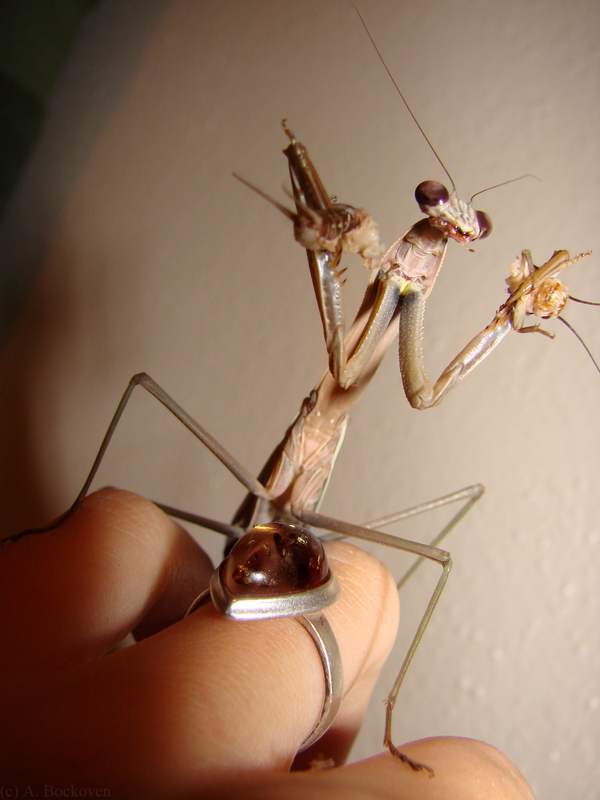 Chinese mantis taking a cricket from a pair of forceps. 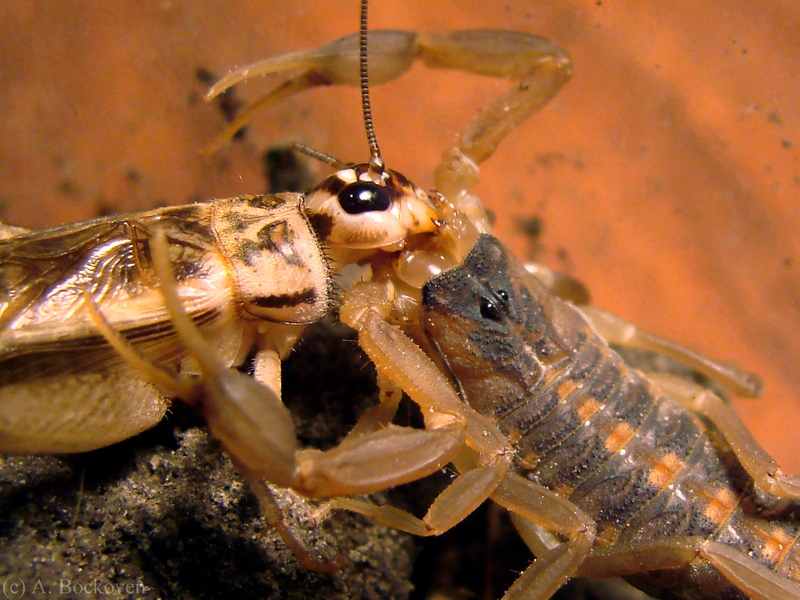 The chelicerae of a scorpion are visible as it devours a cricket. 8legs2many today! I found this little guy hunting near a lightsheet at the Welder Wildlife Refuge. As a general rule of thumb smaller pincers mean a more powerful sting, so I took care handling this little guy. Above, you can see him chowing down on a feeder cricket I gave him. Like spiders, scorpions are arachnids, with eight pairs of walking legs. Their large front claws are not true legs, but actually modified pedipalps, appendages on the prosoma used by chelicerate arthropods for handling food. While snapping pictures and shooting video clips of this guy I also got a chance to get a close up look at another cool appendage– the chelicerae. These are two sharp pincer-like mouthparts used to grab the food and tear off small pieces. These are pulled into the preoral cavity, where food is digested externally prior to being sucked down in liquid form. Chelicerae are unique to a subgroup of arthropods called the Chelicerata–which includes arachnids, horseshoe crabs, and a weird little group called the sea spiders. In spiders the chelicerae bear the fangs (these were the metallic green mouthparts we saw on the bold jumping spider a few posts ago). Scorpions actually make pretty interesting pets, needing only a warm dark environment with some kind of refuge. Scorpions (and other arachnids) lack the cuticular layer of wax which protects insects from dessication. * It is important to maintain high humidity to prevent them from drying out, particularly for tropical species. They are nocturnal, and so most active at night, which is the best time to feed them. Because they are adapted to living in darkness, they are sensitive to UV light, which can harm them with prolonged exposure. 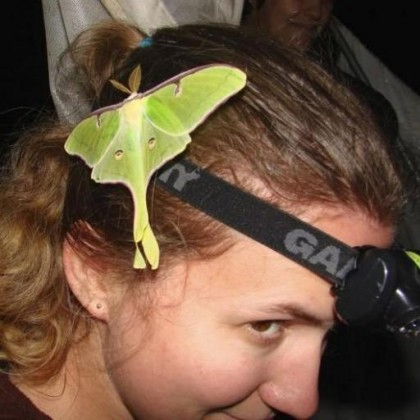 They also fluoresce vividly under a blacklight, which can be a fun way to hunt for them at night, although, again, longterm exposure should be avoided. *Edit: See comments below. Thanks, Dave! Some of my favorite Argentinian insects were these large, colorful lubber grasshoppers. They were certainly striking, and easy to spot with the aposematic coloration they use to warn predators that they are poisonous. Lubber grasshoppers belong to the orthopteran family Romaleidae, so named from Greek “romaleos” meaning “strong of body” in reference to their generally large size. 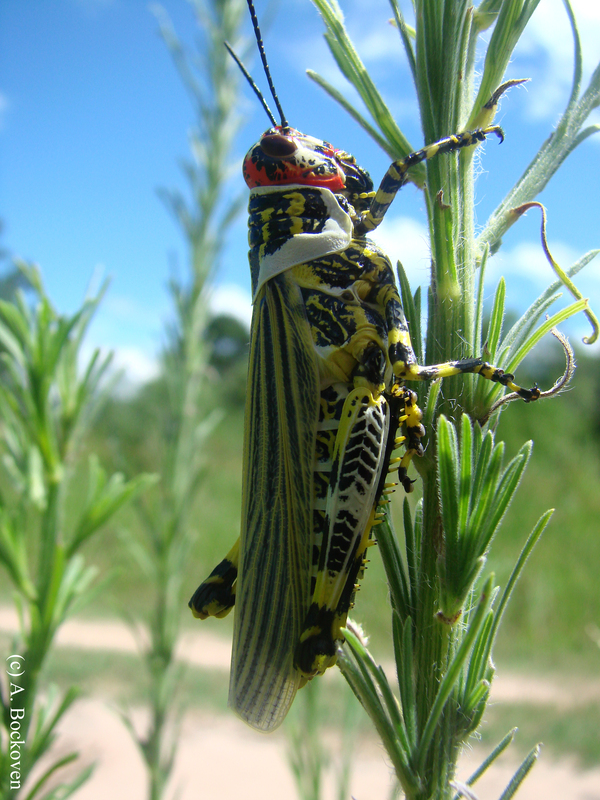 The term “lubber” may also be in reference to the old English use of the word to mean “clumsy” and “stout.” Many lubber grasshoppers also have shortened wings, especially in the females, as we’ve seen previously, and are poor fliers and slow hoppers due to their heavy bodies. 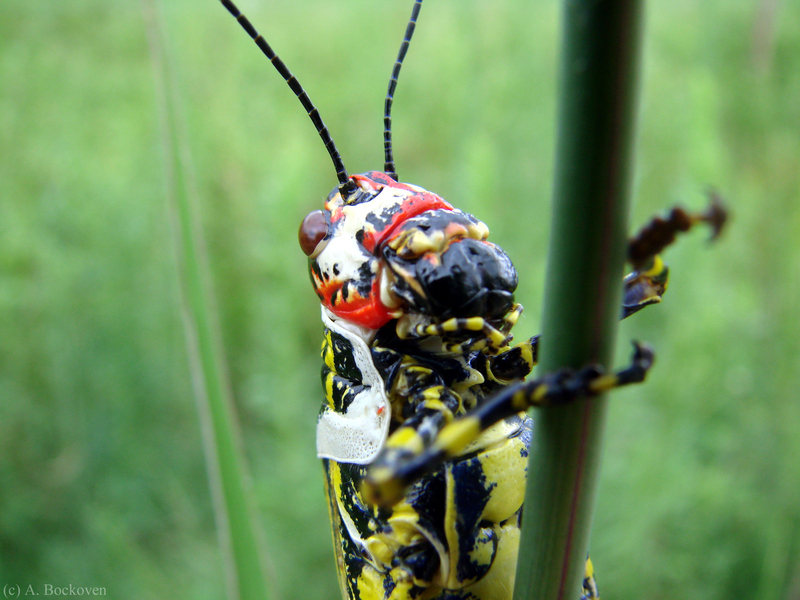 In the case of this lubber grasshopper, any slowness or clumsiness due to body size is compensated by toxic chemicals that make them distasteful to potential predators. An aposematic lubber grasshopper in Argentina (Zoniopoda inheringi).